iabetes is a disease in which the body has trouble using or producing the hormone insulin. Without the hormone insulin, a person’s blood glucose levels can become dangerously high which may cause health problems. This is why diabetes can make living a normal lifestyle much more difficult. People with this disease must closely watch what they eat, as well as take medication, like a shot of insulin before every meal. Luckily, there are treatments and lifestyle changes available for patients to make living with diabetes easier. Clinical trials and research are also available to patients in order to discover new and improved treatments, as well as a potential cure for diabetes. The pancreas is unable to produce insulin. The pancreas does not produce enough insulin for the body’s needs. Insulin resistance – a condition where the body is incapable of utilizing inulin. The body needs insulin to help cells absorb sugar, or glucose, from carbohydrates and fats in foods to produce energy. Without insulin, there would be too much sugar in the blood, since the cells are unable to use or store the glucose. A blood glucose level of 126 milligrams per deciliter or more after not eating anything overnight means that one has diabetes. Having high blood glucose can lead to other health problems, including heart disease, kidney disease, nerve damage, and eye problems which is why it is important to properly manage and treat diabetes to avoid these complications. Type 1 Diabetes is characterized by the pancreas’ inability to produce any insulin due to damaged beta cells, the cells that produce insulin. The beta cells are damaged because type 1 diabetes is an autoimmune disease, meaning the immune system mistakenly attacks these cells. People under the age of 20 are usually the ones to have Type 1 Diabetes. These people must take insulin injections to manage this disease. Type 2 diabetes is much more common than type 1 diabetes. It is characterized by not enough insulin production or the body’s inability to respond to it. Type 2 diabetes usually affects adults over 40 years old and who are overweight or obese. However, because of the rise in obesity, younger people are also being affected by this type. An excess of visceral fat, or fat located in the stomach, has been linked to insulin resistance, and heart and blood vessel disease. People with this type of diabetes must watch their weight and diet and also exercise frequently. Gestational diabetes is characterized by hormone changes during pregnancy, particularly the hormone insulin. This type of diabetes is not very common, only in four percent of all pregnancies, and also can be resolved within six weeks of childbirth if treated (webmd). However, if untreated, complications to both mother and child could occur. Pregnant women who are over the age of 25, overweight, have a history of diabetes in their family, or are Hispanic, black, Native American, or Asian are more likely to acquire this type of diabetes. People with type 1 diabetes are more likely to experience these symptoms. They occur much faster in people with type 1, while people with type 2 diabetes may experience them more gradually, if at all. If you think you are experiencing these symptoms, it is important to talk to your health care provider for proper diagnosis. Type 1 diabetes, type 2 diabetes, and gestational diabetes are all diagnosed by a health care provider through a blood test. The blood test measures the amount of glucose, or sugar, in the blood. A person has diabetes if their blood glucose level is 126 milligrams per deciliter or more after a night of not eating. Self-diagnosis of diabetes is not advised. Over the counter blood tests, like a blood glucose meter, are not proper ways to diagnose diabetes. A health care provider will also ask for any symptoms the patient may be feeling, a full medical history, and if the patient has any family history of diabetes. This will help in diagnosing diabetes, as well as what type of diabetes. 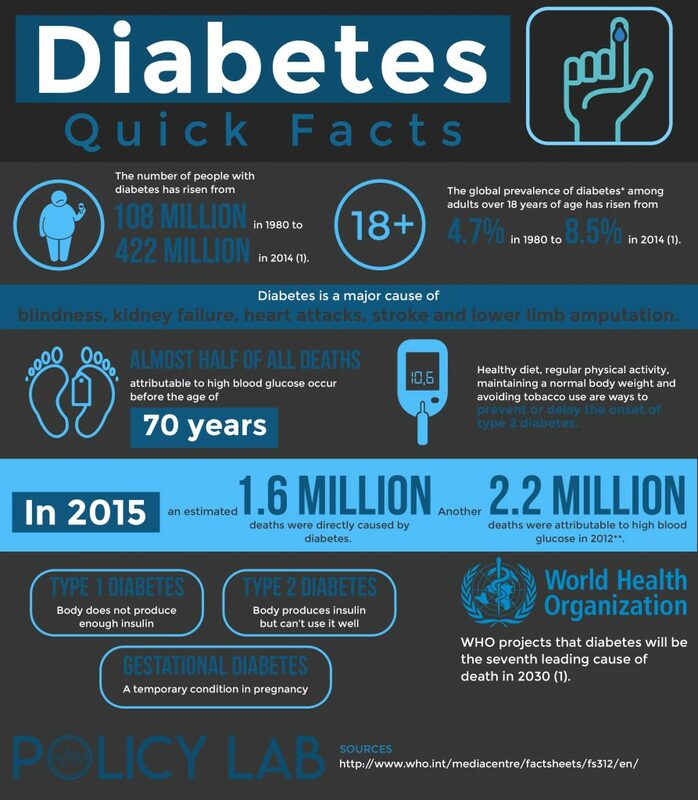 It is advised for people with a family history or any risk factors of diabetes to get tested for diabetes regularly so that they can start receiving proper treatment before any complications arise. For people with type 1 diabetes the most common medication is insulin. There are many different types of insulin. The type of insulin needed depends on the severity of the patient’s diabetes. Amylinomimetric drug – this drug delays the time when food leaves the stomach, reduces glucagon secretion after meals, and lowers blood sugar. For people with type 2 diabetes, the most common form of medication is oral drugs. These drugs mostly help to lower blood glucose levels or help the body produce or use insulin. It is most important for those with diabetes to closely watch their blood glucose levels, blood pressure, cholesterol, and smoking habits. This would be called managing the “ABCs” of diabetes. People watch their blood glucose levels through A1C tests, blood glucose meters, and continuous glucose monitoring systems. An A1C test shows a 3-month average of a person’s blood glucose levels. People with diabetes want to aim for below 7 percent on this test (NIDDK). A blood glucose meter is an over the counter glucose measuring system which patients use to measure their glucose at any given moment. It pricks the finger for a drop of blood and then measures the amount of glucose in the blood. This is important to make sure that people with diabetes are eating right and taking the right medications if needed. A continuous glucose monitoring system measures the glucose levels in the body through a tiny chip placed underneath the skin. This allows for a constant measurement of the blood glucose which can show any changes in the body’s blood glucose levels. Any extreme changes may mean that the patient may need to change what they are eating or take their medications. A healthy blood glucose level for people with diabetes is 80 to 130 mg/dL before a meal and less than 180 mg/dL 2 hours after a meal. People with diabetes should also aim for their blood pressure to be below 140/90 mmHg (NIDDK). It is very important for people with diabetes to also watch their cholesterol. Diabetes raises LDL, or “bad” cholesterol and lowers HDL, or “good” cholesterol. A healthy LDL level for diabetics is less than 100 mg/dl. A healthy HDL for men is higher than 40 mg/dl and for women is higher than 50 mg/dl (American Diabetes Association). Diabetes is usually characterized by having high blood glucose levels, however, it is possible for blood glucose levels to become too low which is very dangerous. A blood glucose level below 70 mg/dL is called hypoglycemia and is very dangerous. Patients must talk to their health care provider immediately if they believe they have hypoglycemia to receive proper treatment and avoid any complications. It is also extremely important that patients stop smoking cigarettes which may narrow blood vessels, which their diabetes is already doing. Narrow blood vessels make it harder for the heart to pump blood throughout the body, increasing the risk of a heart attack and stroke. Any unhealthy levels of blood glucose, blood pressure, and cholesterol could also cause complications such as nerve disease, kidney disease, diabetic eye disease, and amputation. Having a healthy diet and exercising regularly are also very important in managing diabetes. For a healthy diet, it is important to choose foods that are lower in calories, saturated fats, trans fats, sugars, and salt. Exercising for at least 30 minutes or more a day can also have a positive impact on the overall health of someone with diabetes. This healthy diet and exercise will help to lower blood glucose levels, blood pressure, and cholesterol to a healthy level. A healthy diet and regular physical activity will also help patients lose weight if they are overweight or obese, which will also reduce the risk of complications. Starting and keeping an exercise routine can be difficult, so here are some helpful tips! Clinical trials give hope for a cure or for new and improved treatments for diabetes. Pharmaceutical companies hold clinical trials to test their new drugs on patients to see if they are ready to go out in the market. This means that people with diabetes have the chance to not only receive advanced treatment, but also help put these advanced treatments on the market for others struggling with the same disease. CertificateKeep your stress levels down. Stress can raise blood glucose levels and could be dangerous to those battling diabetes. Try peaceful activities to reduce stress like deep breathing, yoga, meditating, or even listening to your favorite music. CertificateIf you are feeling depressed, which is common for people with a long term disease, it is important to talk to a counselor. CertificateLook for and participate in clinical trials! You would be helping diabetes research progress as well as receiving advanced treatment. It can be helpful to know that you are making a difference. CertificateFind a support group. Diabetes may not seem so bad when you learn that you are not alone. In fact, 29 million people in the United States have diabetes (CDC). CertificateMake sure you get enough sleep. It is recommended to get 7 to 8 hours of sleep a night to boost your mood and energy level. If you are having sleeping problems, talk to your health care provider as some sleeping conditions, like obstructive sleep apnea, can come with diabetes.C).